During the holiday season, my family entertains often. For Christmas Eve and Christmas dinner, we spend all day preparing homemade food and decorating the dining room. I’ve sewed this Christmas and Winter table runner numerous times and have enjoyed the results. 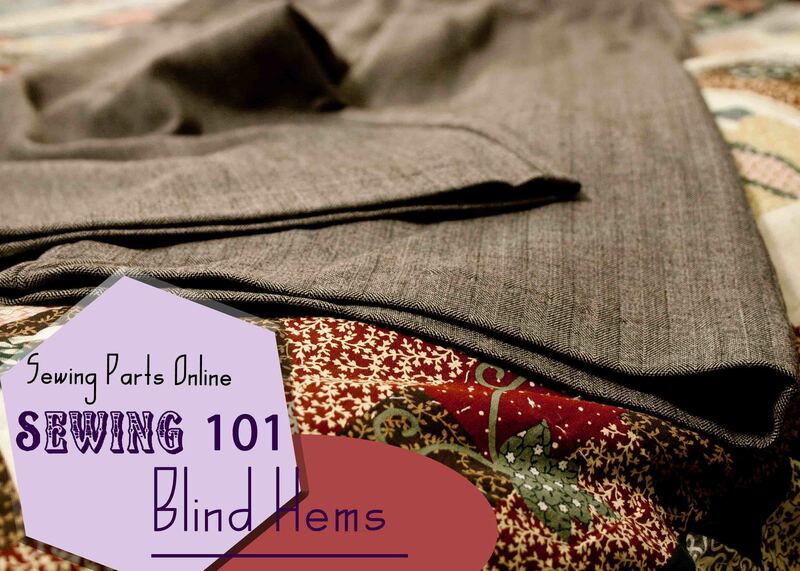 It only takes about 30 minutes to sew (an hour if you add decorative features). I hope you enjoy sewing your table runner and be sure to tag us in a finished photo on social media! 1. At least 12 6 1/2″ x 15 1/2″ strips of fabric for a 5ft table. Add more strips to fit larger tables. Choose a fabric combination from our Christmas Sewing Catalog. To make our Winter Table Runner, we used Option B and Winter Friends Cream Snowflakes from Option A. 2. At least 2 yards of a backing fabric for a 5 ft table. Add more length to fit larger tables. 3. At least 2 yards of batting for a 5 ft table. Add more length to fit larger tables. 4. Basic sewing supplies (ruler, rotary cutter/rotary mat or scissors, Universal Needles, thread). You will need at least 5 1/2 yards of decorative cording/piping and a Zipper Foot. 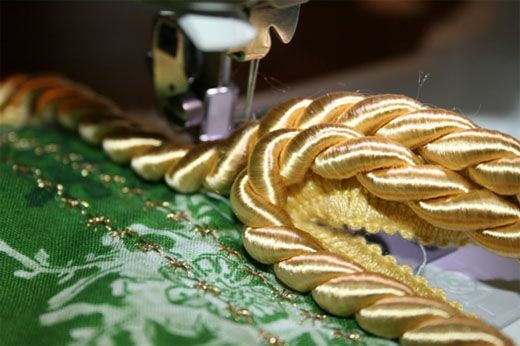 To add decorative stitches, you will need a Monogramming Foot, decorative thread, and a Topstitching Needle. You may also need a Winged Needle for more complex decorative stitches. Measure your table and adjust fabric amount accordingly. I suggest adding two extra strips for every additional foot over 5 feet. So, if your table is 6 feet, you will need 14 strips. If your table is 7 ft, you will need 16 strips. 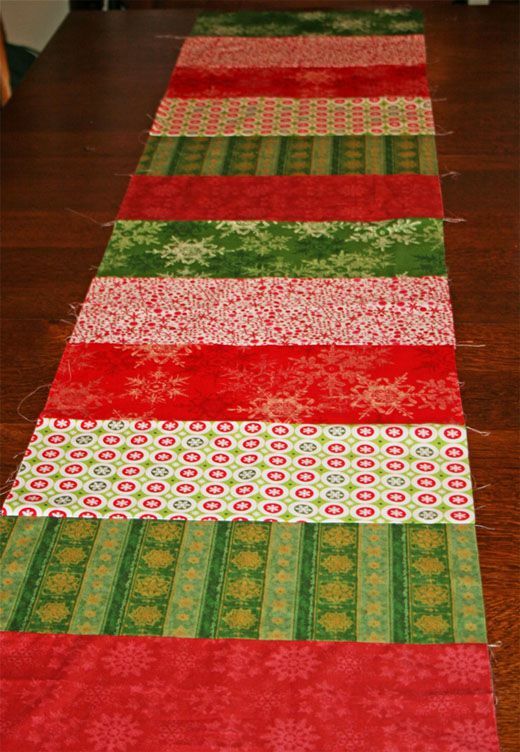 Add additional strips if you want your table runner to drape off the edge of the table. Decorative: If your table is longer than 5 feet, add 24 inches of cording for each additional foot. Arrange 12 (or more) 6 ½” by 15 ½” strips into a pattern you like. 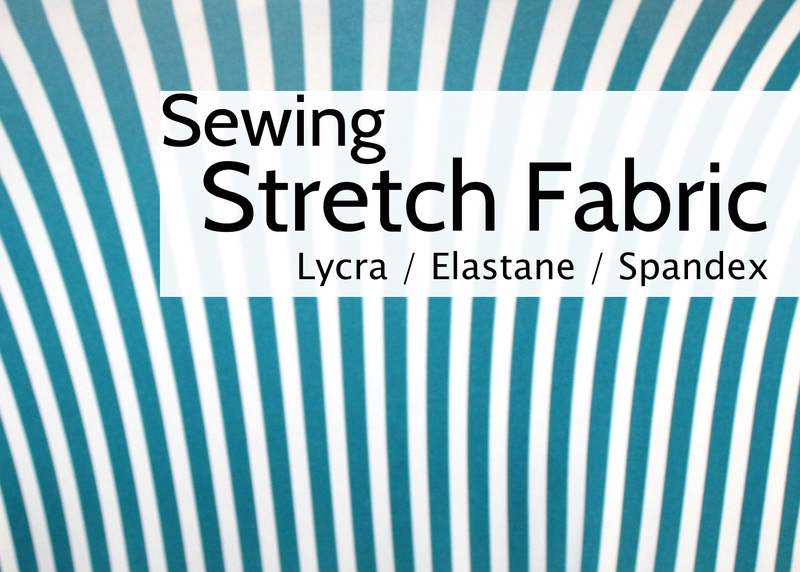 Sew together using a 1/4″ seam allowance. Press seams open. Cut your backing and batting pieces to be two inches larger than your top piece on all sides. Baste your batting and backing together using long basting stitches or basting spray. For those not adding decorative trim or decorative stitches, scroll to the Putting It All Together section. 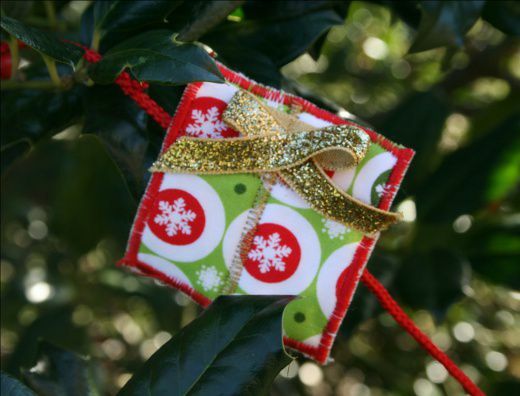 Decorative Version: Sew a 5/8 inch basting stitch along all edges. 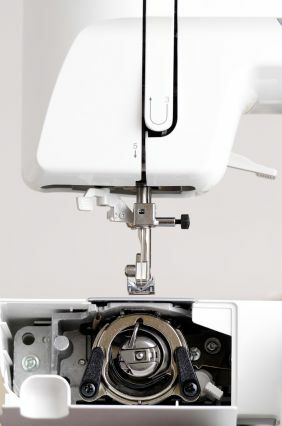 Install a Monogramming Foot and Topstitching Needle (or Winged Needle). 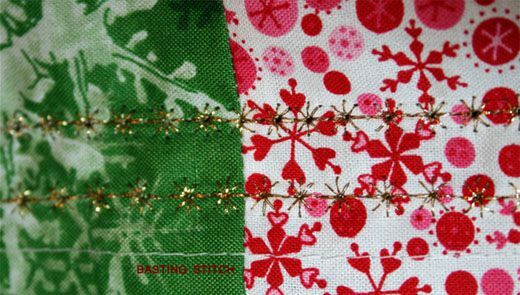 Choose a decorative stitch and use the basting stitch as a guide to sew two parallel lines along the edges. You can sew more lines if you wish. Decorative: Time to sew the cording! First, determine the right side from the wrong side of the cord. Install your Zipper Foot and Universal Needle. Line up the edge of your cording with the edge of the fabric (right sides together). The cord should line up with your basting stitch. Slowly sew as close to the cording as you can, adjusting often. Snip into the cord tape and curve your corners. Decorative: The cord end is a little tricky. Try to sew as close as you can and leave a 3-inch tail. Make sure you tape around the end of the cord before you cut to prevent fraying. With right sides together, place your runner top on top of your backing/batting piece. Smooth out any wrinkles and pin starting from the middle and working your way out. We will sew it together like a pillowcase and turn it right sides out. 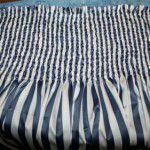 Sew all sides using a 1/4″ seam allowance. Leave an opening large enough to pull the runner right sides out. Turn your runner right sides out and sew the opening closed. You’re finished! 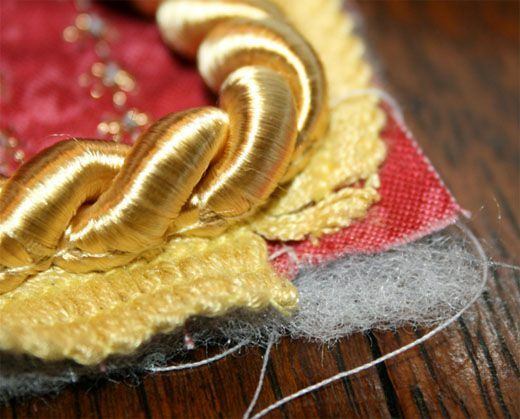 Decorative: To finish your cording, untwist the excess tail length. Tuck the untwisted tails inside the runner, and hand sew the opening closed. Congratulations! 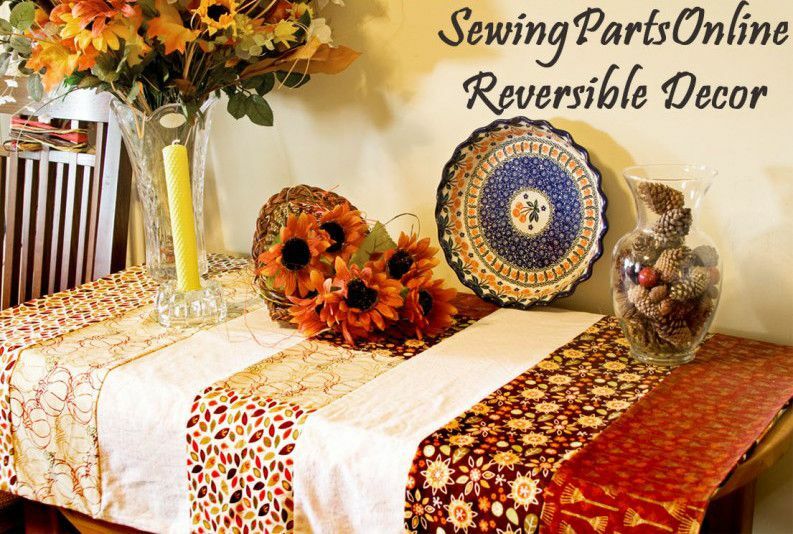 You now have a fabulous table runner to display this holiday season! Why does my back and shoulders hurt when I sew for long hours? I am confused about one point. We piece the top together. Then you say to baste your batting and BACKING together before adding decorative stitches (yet you show the pieced top). Is the pieced part the BACKING? or should we be basting the batting and the Pieced top together? I know how I would make this, but a beginner might be pretty confused. Please clarify. Hi, Kim! I’m so sorry for the confusion. Basting the backing and the batting together is separate from the top piece. 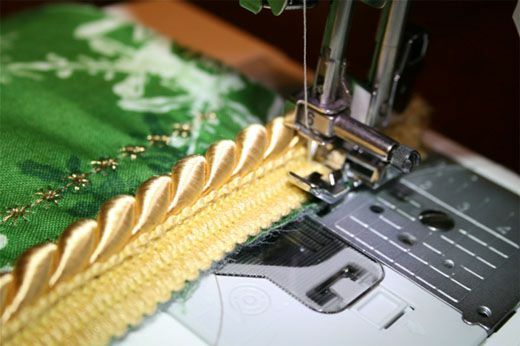 If you want your decorative stitches to appear quilted, you would baste the top piece to the batting, sew your decorative stitches, then attach the backing. I understand that is a bit confusing. Please feel free to email me at info@sewingpartsonline.com (ask for Sarah) and I can help walk you through the whole runner step by step. 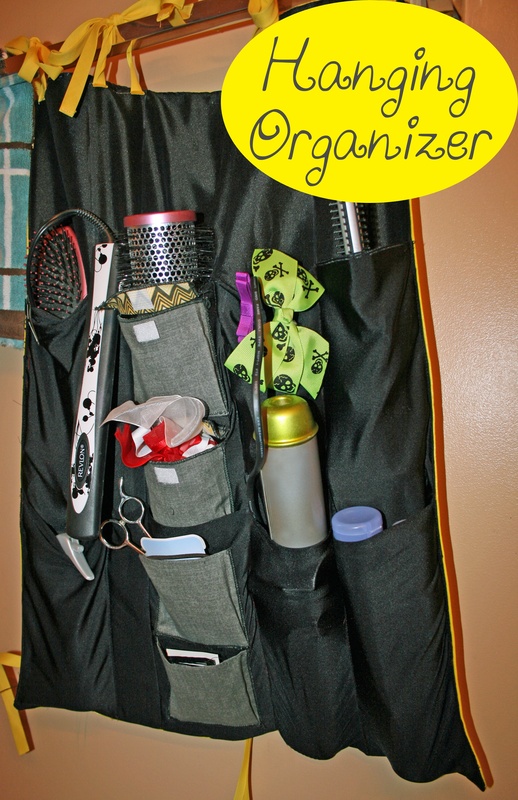 It’s a great project to have in your bag of tricks. Thank you so much for your experience and willingness to share. How do I save your tutorials for future use. Hi, Pat! You can bookmark these tutorials to your internet browser. You should see a little star on the left side of your internet browser bar. When you find a tutorial you like, simply click the star. It will turn yellow, indicating that the webpage has been saved. 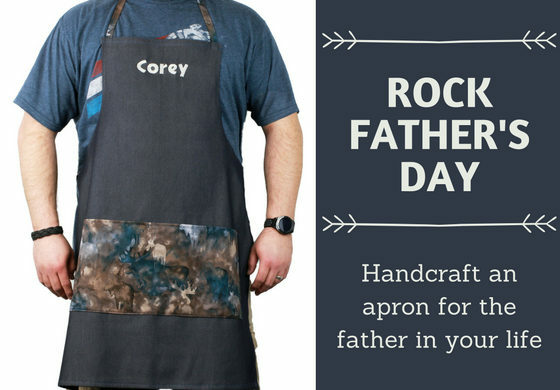 You can also email the tutorials to yourself or “pin” them to your Pinterest Board. I hope that helps! 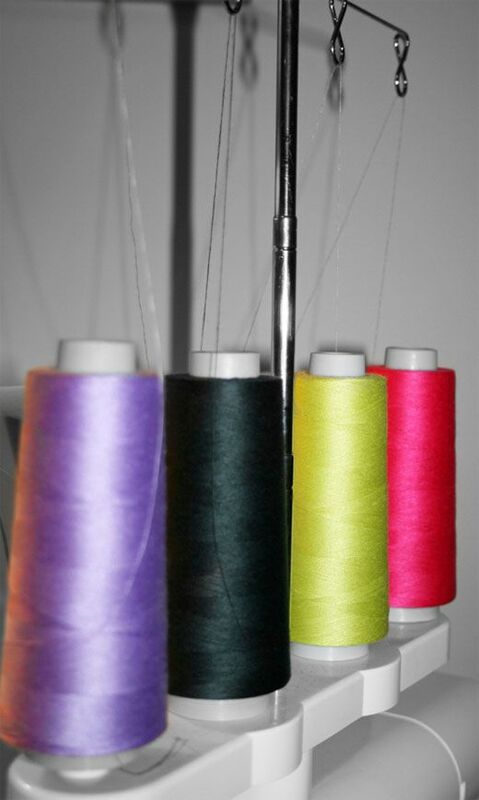 Feel free to email us at info@sewingpartsonline.com if you need additional assistance. We’re happy to help! I love your tutorials , makes new projects much easier. I think you have the best job around. Love all the helpful information. Keep smiling. Hi, Lynn! I do love my job! Thank you for your kind words! Hi, Mary Ellen! I can help sign you up. Would you like to be signed up using the same email you used to comment on this blog? Hi, Elizabeth! Thank you for your kind words! We hope you are having a lovely fall in the UK – I hear it gets very cold across the pond! My pleasure! Thank you so much for your kind words! Hi Mary! We would be honored for you to join our email list. 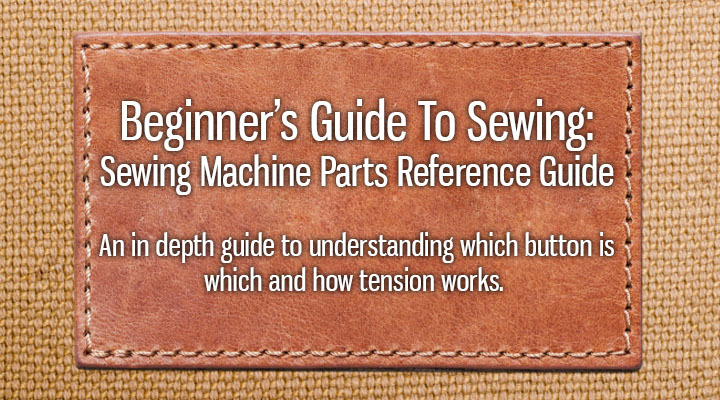 If you go to this page https://www.sewingpartsonline.com/contact-us.aspx and scroll to the bottom, you’ll see a white box on the right. Enter your preferred email address and we’ll start sending you our weekly coupons, videos, and tutorials. Thank you!